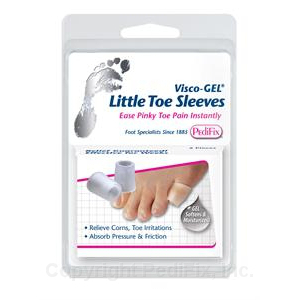 PediFix Visco-GEL® Little Toe Sleeves™ are sized specifically to fit the pinky toe. They slip on easily and surround the toe with a soothing Gel that absorbs pressure and friction. PediFix Visco-GEL® Little Toe Sleeves™ are sized specifically to fit the pinky toe. They slip on easily and surround the toe with a soothing Gel that absorbs pressure and friction. Relieve corns, blisters, ingrown nails, pinching, cramping and more. Fit comfortably in most shoes. Immediate relief for 5th toe pain.